Gundlach wrote in September, "Yields: On the march! 10's above 3% again, this time without financial media concern. Watch 3.25% on 30's. Two closes above = game changer." At the latest reading, the rate on the 30-year bond was at 3.307 percent. The 10-year yield was last at 3.155 percent. 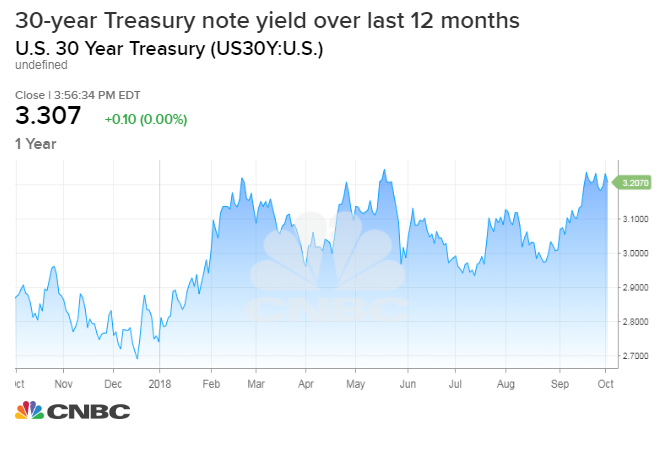 Treasury yields soared Wednesday as economic data fostered optimism about the American economy, sending both the 10-year rate and the 30-year rate above multiyear highs, and beyond what "Bond King" Jeffrey Gundlach dubbed a "game changer." As of the latest reading, the rate on the 30-year bond was at 3.307 percent following blowout jobs data from ADP and a record-breaking expansion in the services sector last month. The 10-year yield was last at 3.155 percent. So if we hold at these levels through Thursday, Gundlach implies we could be entering a new paradigm of higher rates. DoubleLine's assets under management totaled more than $120 billion as of June 30. Though Gundlach was not available for comment Wednesday, he emphasized to clients in September that DoubleLine's modeling suggests fast inflation is ahead. The Fed's preferred inflation gauge — the personal consumption expenditures (PCE) price index less food and energy — though unchanged as of the latest monthly read, was last reported at 2 percent on a year-over-year basis. "I have to scratch my head when I hear people say that we're having problems getting inflation to the [Fed's] 2 percent target because even the core numbers ... seem to be well into the 2 percent zone," he said during a webcast in September. The billionaire investor added "there's good reason to believe that, maybe, core CPI goes higher still," he added.